We are experts in the movement, transfer and relocation of drilling rig and oilfield equipment in the Western Canadian Sedimentary Basin, Alaska and Canadian Arctic. As a customer-based service company and as individuals, we accept the responsibility and challenge of providing customer excellence. Request a Quote to get started. 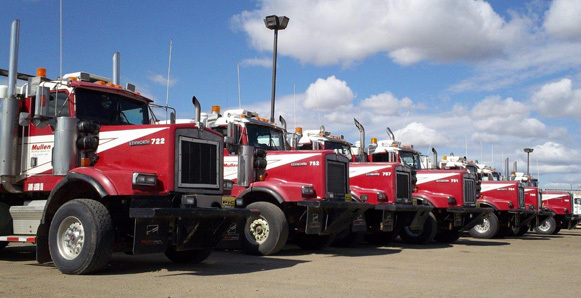 Mullen Oilfield, with five full service terminals is able to supply location-to-location rig moving services for our Customers throughout Canada. Our ability to support large or small Rig Moves utilizing experienced local Mullen crews ensures your project is always completed to the highest standard of safety and efficiency. The crews working on your job understand the area they are working, this allows for proper pre-job planning and execution. We take pride in being able to provide the best local solution for all your needs throughout Canada. Mullen Oilfield is an industry specialist in the inter-provincial and cross-border movement of drilling rigs and related equipment. Our fleet, along with experienced employees, understands all regulations and requirements to ensure your project will be completed properly and on time. The unique nature of long distance moves requires proper logistical planning and access to a large amount of drivers and equipment. At Mullen any project undertaken will be completed to the highest safety standard with our employees ensuring acceptable procedures and guidelines are followed. Mullen Oilfield Services is the chosen local and international rig transport company for some of the largest oil and gas companies in the world. We will continue to develop an infrastructure that will support growth and accountability by including committed individuals who work together to meet the demand of productivity and safety. Contact us to speak with a representative or use our Request a Quote form to get started.